Download the ‘Lonely Life’ movie (starring Will Oldham) available HERE. Even though it’s not obvious, YOU ALSO GET A DIGITAL DOWNLOAD OF THE COMPLETE ALBUM when you buy the movie. Last year ((SOUNDER)) front-man, visual artist and film maker Mike Aho premiered his short film ‘The Lonely Life’, starring Will Oldham (Bonnie ‘Prince’ Billy) to a sold out crowd at The Scottish Right Theatre in downtown Austin, all the while he was working on another film that would eventually go to number 1 on iTunes (sports) and become the first solely action sports film to be accepted onto Netflix world-wide. For Aho, Volcom’s ‘True To This’, a feature film highlighting the diverse set of world renowned skateboarders, surfers and snowboarders that ride for California based clothing company Volcom, was not only another film he was working on, it was an all-encompassing vehicle for his music and unique visual direction. Aho’s music project ((SOUNDER)) will release it’s long awaited album ‘The Howlingest Call’, featuring the music of ‘The Lonely Life’ and ‘True To This’, on cassette only (with digital downloads) through Austin multi-media record label Monofonus Press. ‘The Howlingest Call’ features collaborations with Bonnie ‘Prince’ Billy, Gradaddy’s Jason Lytle and the musicianship of Jesse Lee and Tom Hoff, formally of Austin’s own American Analog Set, among others. Aho’s musical compositions in many ways reflect the aesthetic that he has carved out as a visual artist, video director and film maker, with fuzz-ridden pop sensibilities that take you from emotional hooks to ambient looping melodies, sometimes within the same song. He has honed his craft over the last decade creating everything from skateboard graphics to video comedy series, namely a song and video he wrote and directed as a collaboration with Wayne Coyne (Flaming Lips), Biz Markie and the children’s show Yo Gabba Gabba and a web series called ‘The Internet Shack’, which he directed and co-wrote with Austin’s Michael Sieben for Thrasher Magazine. 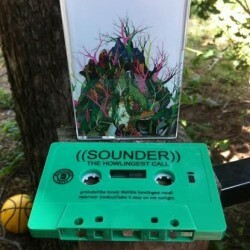 ‘The Howlingest Call’ is the 3rd full-length studio album by ((SOUNDER)) and will be available through Monofonus Press.